Your weekly round-up of local news for 20 – 26 February. There was a further heatpipe meeting with Vital Energi on Thursday. They are making good progress with just a few delays. My note about this and how they will manage the London Road work is here. All my posts about the project are under the ‘Energy Project’ tab in the main menu, and there’s a page of links and contact details here. After Jacobs Chop House became Jacobs Brasserie, another restaurant has changed its name. What was Bar Meze is now Desi Lounge Thali & Grill House. According to Wikipedia, thali is an Indian style of serving a selection of sweet, salt, bitter, sour, astringent & spicy foods on one plate. The Oxford Times carried an article about it including some words from the owner. Vandals did some damage with cans of paint and smashed a defibrillator at Marston Saints Football Club in Boults Lane, Old Marston last week. It happpened overnight on 13/14 February. At its meeting on Tuesday the West Area Planning Committee approved the installation of a memorial to Oxford men who died in the Spanish Civil War. 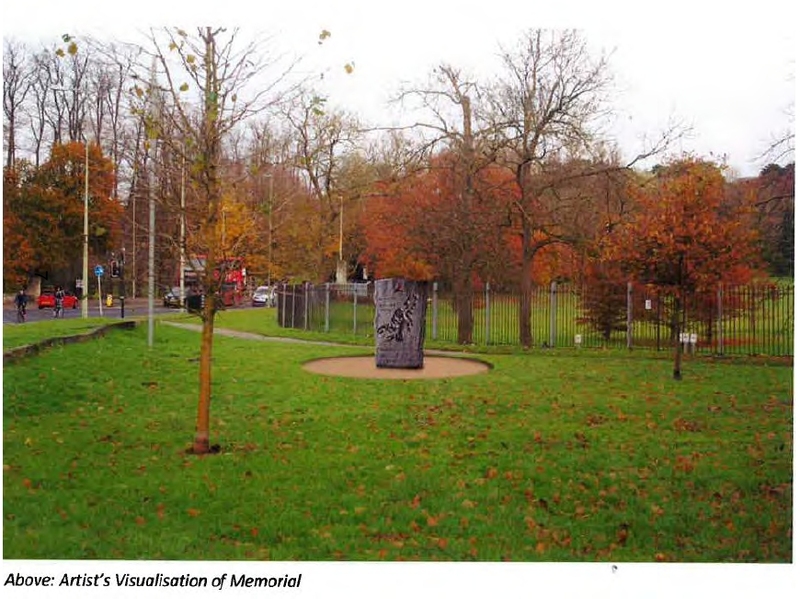 The memorial will be erected at the bottom of South Park by the International Brigades Memorial Trust (IBMT) @IBMT_SCW who are raising funds to pay for it. As expected, the County Cabinet voted to sell the Harlow Centre site in Marston to the Government and contribute £2m towards the construction of a new free school – the Swan School – on condition that the Education Secretary seals a funding agreement with the River Learning Trust. The roadworks at the junction of Old Road and Gipsy Lane are virtually complete, but there are a few snags which I think could have been avoided with better supervision of the work. The new Aldi is going to open on 9 March. It’s where Curry’s used to be on the small trading estate on Horspath Driftway where Homebase is. 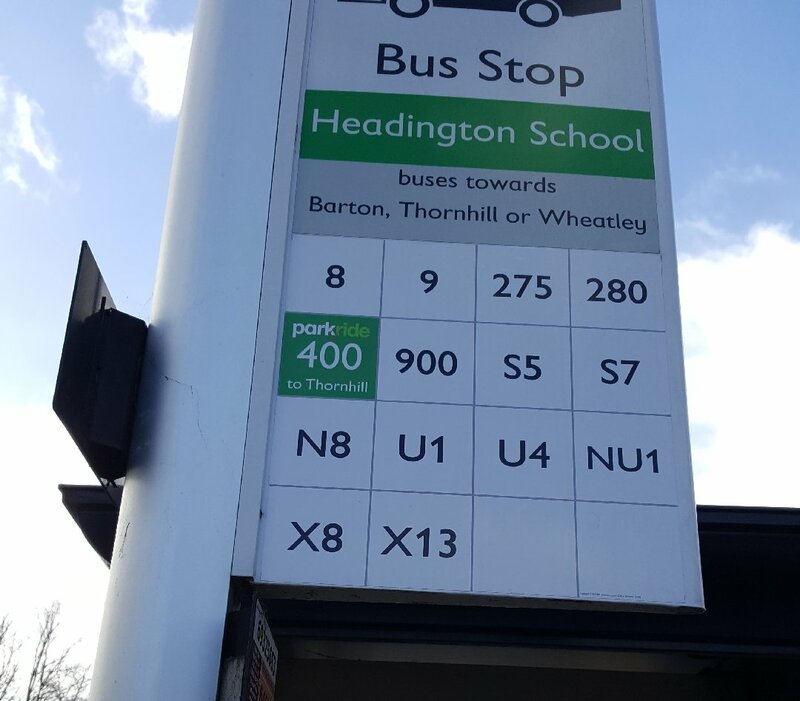 I don’t know when it started, but Aviva are running a ‘new’ bus route through Headington, the X8. It follows a similar route to the 280 joining Thame to Oxford Railway Station, but unlike the 280 it misses out Wheatley. Two early buses run Aylesbury – Thame – Oxford, missing Haddenham as well as Wheatley, with two making the return trip to Aylesbury at the end of the day. The Aylesbury – Oxford journey is 7 minutes shorter than the 280; the Thame – Oxford trip 6 minutes shorter. X8 bus route through Headington. And X13? This twitter conversation harks back with regret to the good old days of the Manor Football Ground and the pubs fans used to visit. Police helicopter action over central Headington on Saturday prompted some chat on twitter, culminating in an appeal from the police for information about a missing man. He was found safe on Sunday. Cycle Path Signs – How High?